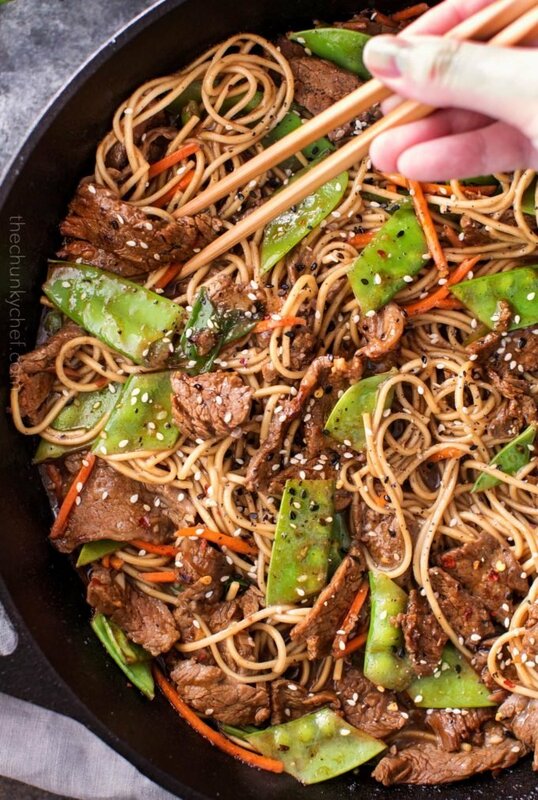 This easy sesame beef stir fry is incredibly flavorful and easy! Serve with authentic ramen noodles, over rice, or in a lettuce cup for a lower carb version! Chinese takeout is something we all love right? 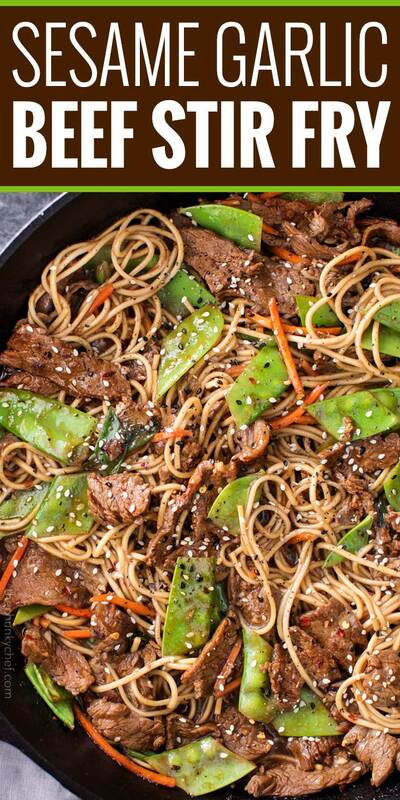 Sesame Beef Stir Fry is a guilty pleasure and takes so little time to arrive to your door! 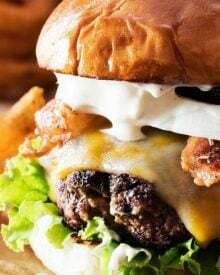 But what if I told you that you could make something every bit as tasty, in just about the same amount of time… and YOU get to control the ingredients? Sounds amazing right? 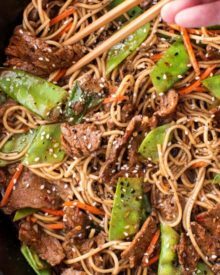 Besides being amazingly flavorful, this beef stir fry is actually fairly healthy as well, since it doesn’t use gobs of oil and a serving rings in at under 350 calories! In many ways, yes! The tender crisp vegetables actually retain more nutrients by cooking quickly in a wok or skillet than they would if they were boiled. This particular stir fry uses two different kids of oils, but in relatively small amounts, which is much healthier than cooking in a large amount of oil (like most takeout Chinese restaurants do – at least in my area). Sauce – broth, soy sauce, vinegar, sugar, and oil. 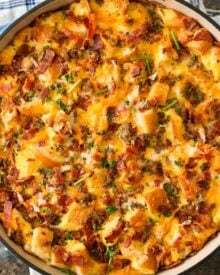 Play around with added flavor by adding garlic, ginger, green onions, etc. Usually stir fries are served with rice or noodles. But two great healthy options are lettuce cups and cauliflower rice! For this particular beef stir fry recipe, I chose some authentic ramen noodles (not the ones from a packet, which is why they’re not curly). I’ll link to the ones I buy at the end of the post, they taste great! 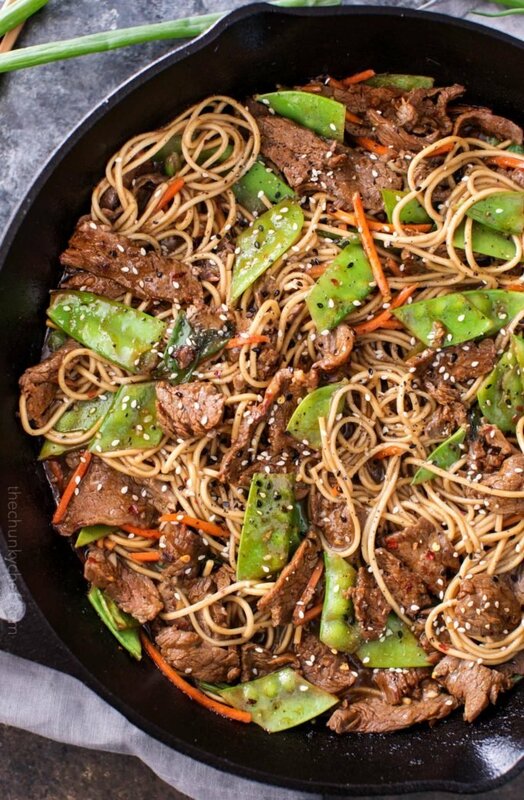 Because stir frys cook so quickly, you want a cut of beef that’s already tender. I nearly always use flank steak, but a thinly sliced ribeye, sirloin, tenderloin or tri-tip would work as well. Slice the flank steak when it’s still partially frozen. This lets you get the slices super thin, with minimal effort! Make sure to slice the steak against the grain. When you look at the flank steak, you’ll see thin white lines running across it. By slicing perpendicular to the lines, you make the steak super tender, instead of chewy and tough. 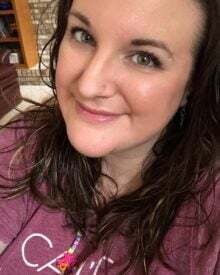 I have a few step by step photos here so you can see exactly how to do it. 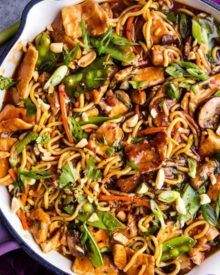 The next time you’re craving some amazing Chinese take-out, try whipping this stir fry up instead! 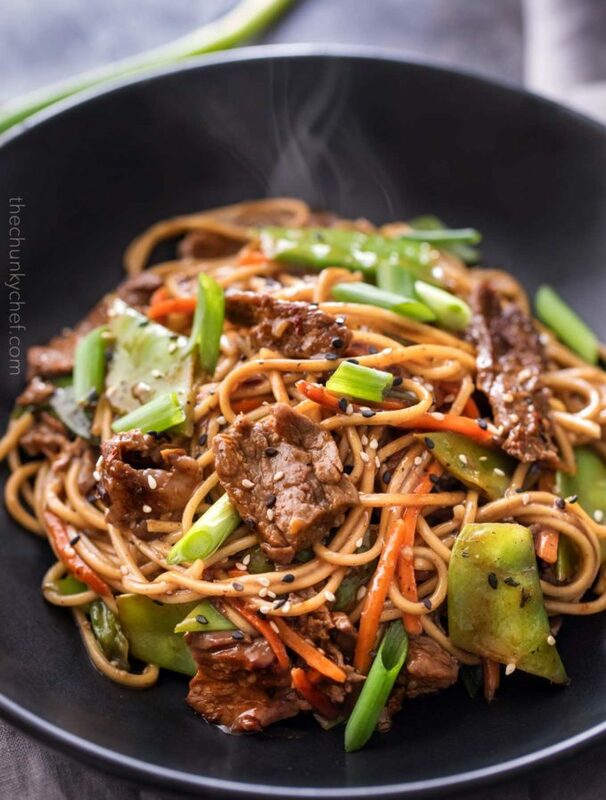 The tender strips of beef, crisp-tender vegetables, and authentic ramen all wrapped in a luscious stir fry sauce thats loaded with ginger, garlic and sesame make for a meal that’s WAY better than anything from a takeout restaurant! Cast Iron Skillet – I don’t own a wok yet, so I make this stir fry in my big cast iron skillet. It gives the beef an amazing sear! Stainless Steel Tongs – Perfect for so many things in the kitchen, I use these daily. Ramen Noodles – I like these a lot, but if you’d rather, the packs of curly dried ramen (that are like 10 cents at the grocery store) work too. Just use the noodles, NOT the seasoning. 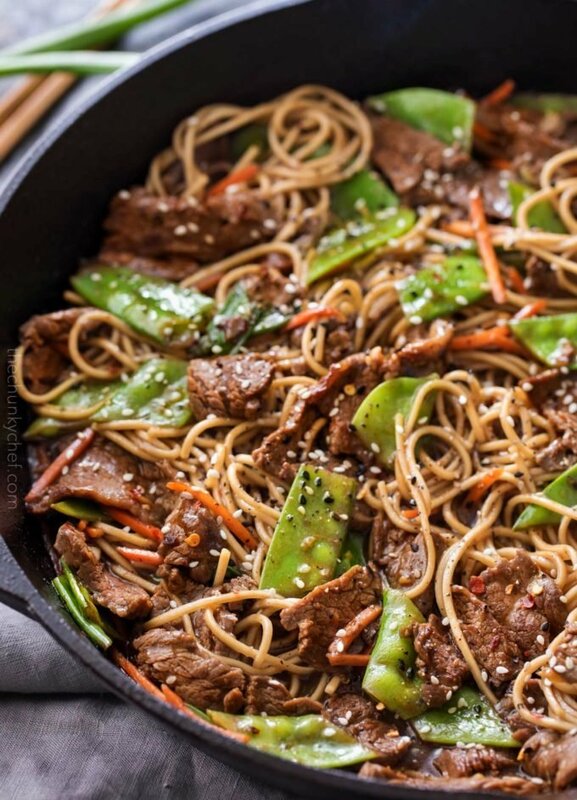 Want to try this Beef Stir Fry? PIN IT to your TAKEOUT or BEEF board to save for later! 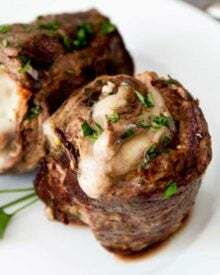 Combine marinade ingredients in a bowl and add flank steak. Turn to coat and set aside for 15 minutes. Heat 1 Tbsp vegetable oil in a large skillet over MED HIGH heat. Remove excess marinade from steak and cook in a single layer for 2-3 minutes, stirring to cook both sides. Depending on the size of your pan, you might need to cook the beef in batches. Remove steak to plate. Heat remaining 1 Tbsp vegetable oil in skillet, then add peas, carrots and green onion and cook, stirring often, for 2-3 minutes. Whisk together broth, soy sauce, brown sugar, rice vinegar, garlic, sesame oil, fresh ginger, cornstarch and red pepper flakes. Add steak and sauce to skillet, stirring to combine. Sauce will thicken. Stir in cooked ramen noodles, if using, and serve! 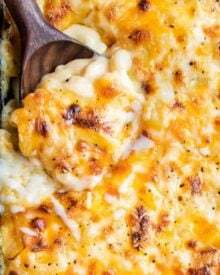 This is an amazingly delicious recipe. Husband called it fantastic! Fantastic! We loved it. I almost never follow a recipe verbatim but I did this one. Except I had 1.5 lbs flank steak. Also used Hokan lo mein noodles. This one is going to the “a list”! 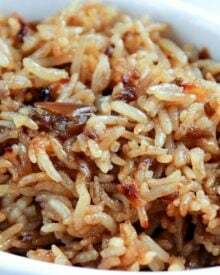 Instead of rice vinegar, can you substitute it for water? I wouldn’t substitute it with water, as it wouldn’t add any flavor. Apple cider vinegar would be a decent substitute though. We love stir-fry recipes! This one is a must-make! Wow this stir fry looks like the perfect weeknight dinner! I love how easy it is! 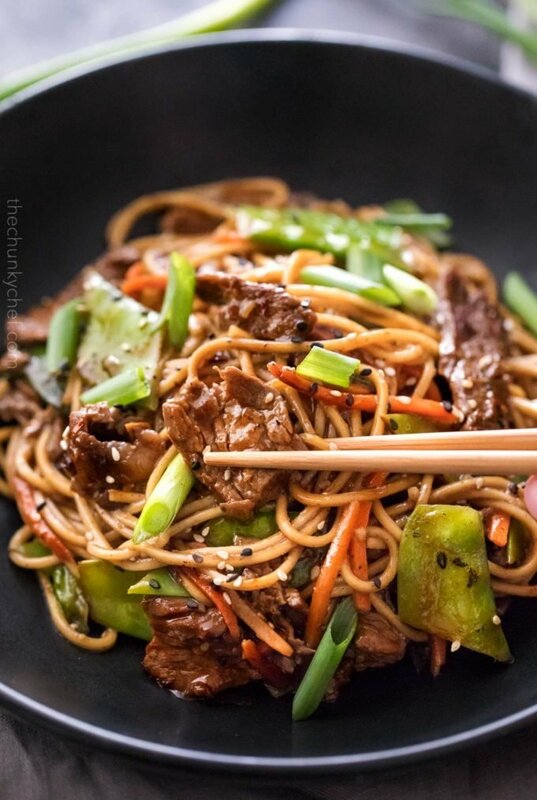 Stir frys are such a great way to get a flavorful meal on the table fast! Looks fantastic! All that flavor and still under 350 calories? Amazing! I simply can’t wait to make this delicious looking stir fry! 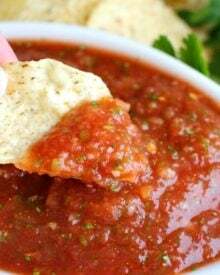 Wish I had a big bowl of this right now! Looks delicious! I can’t wait to try out the recipe! You can never go wrong with a delicious stir fry! One of my favorite dinners! So much flavor!